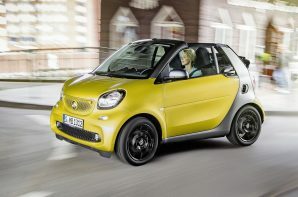 The smart fortwo has always been an acquired taste but many of the engineering rough edges have been smoothed away over three generations of development. What hasn’t changed is the pint-sized proportions combined with a full length folding roof offering a unique open air experience. Stumping for a convertible suggests that the buyer will be more interested in ambience than outright performance and the fortwo excels here. The dashboard covering deserves particular praise; the sports shoe style fabric is probably very cheap to make but really lifts the interior and is much more interesting than the swatches of plastic normally found in City Cars. Substantial progress has also been made with the ride quality which is the best yet. However you can’t defy the laws of physics, and over repeated bumps taken at speed the very short wheelbase does mean that the baby smart can feel like a skimming stone. It is usually more of a sensation than a total aeroplane moment but it does mean that the fortwo requires concentration and a surprising level of commitment to drive quickly. Back in the every day world the incredible turning circle of just 6.95 metres is a boon, and there is surprising boot space on offer with 260 – 340 litres available it can compete with cars two classes bigger. If you do opt to go for the full alfresco look by taking off the roof bars, there is a clever storage space inside the rear hatch so you won’t get stuck with the roof down if the weather takes an unexpected turn for the worse. To get the best official fuel consumption you need to opt for the automatic gearbox in combination with the higher powered engine. In days gone past, the mere mention of the smart’s auto ‘box was enough to bring even hardened hacks out in a cold sweat. The good news is that the fortwo now has a modern 6 speed dual clutch transmission which is far more accomplished. The fortwo cabrio is very cleverly designed making it far more practical than you might think and it is ideally suited to the urban environment thanks to its size and manoeuvrability. The only real downside is the price; the fortwo has always been expensive and this iteration is no different but it does offer something unique.